Today is the day that you begin the impossible task of distinguishing Ross Geller from Nicolas Cage. Some evil genius decided to photoshop Cage's face onto David Schwimmer's in a Friends scene, BuzzFeed pointed out after discovering a Reddit thread from spaghetticondom. The result? A Ross Geller that looks exactly like Ross Geller but is actually Nicolas Cage. I hate to break it to you, but they're essentially the same person. The deed was actually done by YouTube user derpfakes, who has superimposed Cage's face on a bunch of famous characters before - a wild ride of deepfakes worth exploring at a later time. 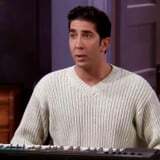 The particular Friends scene is from season four, episode seven ("The One Where Chandler Crosses a Line"), when Ross plays his music for the gang. The YouTuber swapped everyone's faces with Cage's, but the Ross swap is the only one that's causing a meltdown. Watch the video ahead, and prepare to be genuinely perplexed. Looks like a beer thief in the UK isn't the only person with a striking resemblance to Schwimmer.